PORTLAND, OREGON - October 09, 2013 - Expatriate, a cocktail lounge, is the latest addition to NE 30th and Killingsworth. It is the creation of Kyle Linden Webster, who has crafted the drinks menu, with an assist from his wife Naomi Pomeroy on the food menu. We walk down rain-soaked streets and into the bar, passing under a pair of ironclad bells chiming in the wind. Inside, sheltered from the storm outside, we sit near the darkest corner and order strong cocktails. A blood-red candle gutters at the table. Expatriate, the new Northeast Portland cocktail bar with drinks from Kyle Linden Webster and drinking snacks from chef Naomi Pomeroy, looks like a four-star opium den. It lurks, coiled and expectant, within sight of Beast, Pomeroy's fine-dining destination. You might have thought Webster, dressed in a striped shirt borrowed, it seems, from the costume department of a Jean-Luc Godard film, had already found his ideal perch at St. Jack, the Lyonnaise-inspired bouchon where he tended bar for nearly three years. 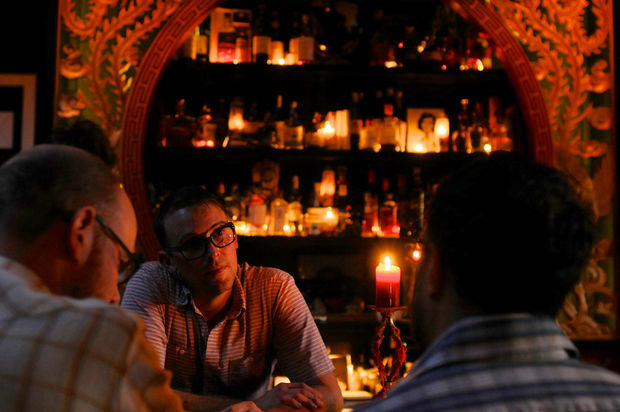 But after Pomeroy returned from a recent trip to Myanmar inspired by that country's cuisine, the husband-and-wife act began plotting the bar that became Expatriate. Near the window, Webster swaps the dimly projected movie on the wall -- "True Stories" replacing "The English Patient" -- then heads back behind the bar. 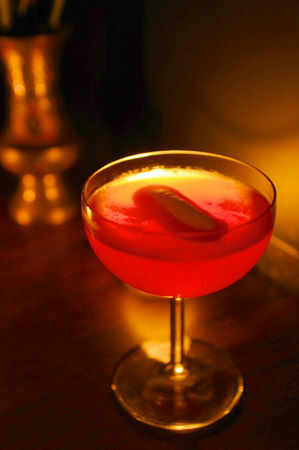 There, he and his team shake and stir a list of eight cocktails, some originals, some tweaked classics, the dominant themes being mature, citrus-forward flavors drawing from the bar's selection of ornate liqueurs. My favorite, the Shanghai, is a high-wire act blending aged rum, Curaçao and Pomeroy’s own vanilla and lime-infused grenadine. You’ll want to order the Ornament And Crime, a mix of bourbon, Becherovka and fresh lemon, for the name alone. And you would be right to. Expatriate's take on the Pegu Club, the 80-year-old gin drink made famous at the Yangon hotel of the same name, might be the most straightforward Burmese item here. At first glance, Expatriate's food menu looks like Portland's latest stab at the kind of Asian fusion 2.0 currently in vogue from here to New York and back. But the influences are more complicated. How do you reconcile a menu that includes samosas topped with sumac ranch and James Beard's unreasonably delicious butter and onion sandwich? The answer might lie in the decor. The red-and-gold arch framing the back bar was once a part of The Pagoda, the former Hollywood Chinese haunt known for its chintzy-glam decor and terrible food. Some dishware comes from Southeast 82nd Avenue's Chinese Village, built when Portland's Chinese restaurants doubled as honky-tonk joints. This is orientalism through a historical filter, with all the nostalgic appeal of a vintage cookbook. 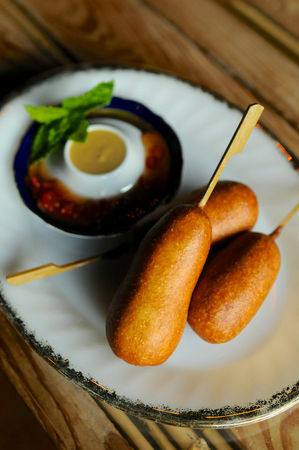 Which might explain why decadent, soy-ginger-infused shrimp toast arrives alongside a plate of corn dogs, their golden batter enveloping a loose Chinese sausage, each dog meant to be dipped into a sinus-searing mustard. Other smart chefs beat Pomeroy to using Dungeness crab in Crab Rangoon, the faux Burmese dumplings usually credited to Tiki pioneer "Trader" Vic Bergeron. But kudos to Pomeroy for knowing a good idea when she sees it. At Expatriate, crisp, tidy packets stuffed with generous Dungeness and mild cream cheese arrive under Thai chili slaw with a pool of light curry sauce. They're delightful. There are missteps here and there. The spice-tossed fries cancel out the flavor of the accompanying curried ketchup dip, and each overpowers the delicate halibut sandwich. You might wish the "Burmese tea leaf, papaya and cherry tomato" dish were renamed -- I expected lahpet, the fermented tea leaf salad that is Myanmar's national dish; what arrived was a papaya salad with some tea leaves (a fine papaya salad, but still). Another salad, with cucumbers arrayed in a mandala-like pentagon, would pick up the Szechuan-ish flavor of the "very spicy" sauce better if the cucumbers were sliced more finely. If you stick to the bottom quarter of the menu, you might encounter a bowl of sticky brown-butter noodles dotted with fresh corn kernels; a Korean fried game hen with a rich, tangy pickled watermelon ranch; and a strawberry-filled, coconut-glazed doughnut with black sesame ice cream. And you might walk away thinking Pomeroy is Portland's new queen of comfort food. Cuisine and scene: A new Northeast Portland cocktail lounge with drinks from ex-St. Jack barman Kyle Linden Webster and drinking snacks from Naomi Pomeroy, the celebrity chef behind nearby Beast restaurant. Recommended: Shrimp toast, James Beard's onion and butter sandwiches, crab paste and corn noodles, Korean fried game hen, the Shanghai cocktail. Vegetarian friendly? French fries, samosas, salads. Beverages: Cocktails, sakes, wines by the glass, bottled beers, soda. 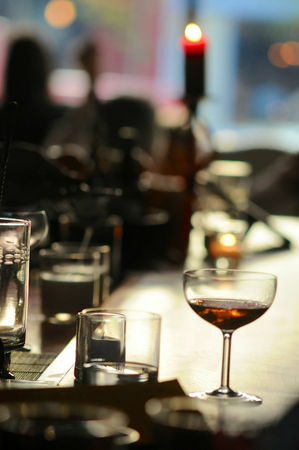 Price range: Cocktails, $10; small plates, $4-11; salads, $6-$12; larger plates, $12-$13; dessert, $8. Extras: No reservations; major cards; street parking; handicapped access. Serving: 5 p.m. to midnight, daily.